The Town Administrator is Berwyn Heights’ chief administrative and financial officer, supervises the daily operations of the Town, and implements the Town Council’s goals, objectives, policies and priorities. The Town Administrator appoints all employees, with the exception of department directors, which are appointed by the Town Council. 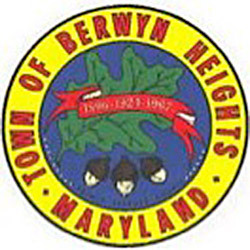 Berwyn Heights has administrative offices as well as police, public works, and code compliance departments. The Police Department has eight officers, 24-hour coverage, and uses the Prince George’s county radio system for all calls. The Public Works Department has a nine-member crew that is responsible for trash pickup and that performs general maintenance work on Town facilities, green spaces, and roads. The Code Compliance Department ensures the health, safety and wellbeing of Town residents by enforcing building, property and environmental codes. The department is composed of a code supervisor, two part-time code officers, and one part-time code clerk. In addition, the Town of Berwyn Heights has a wealth of recreational facilities and programs, including playgrounds, athletic fields, and two nearby parks. An active Recreation Council works with other organizations to host community celebrations throughout the year; the Town Administrator works with these organizations in support of the events. The Town also works collaboratively and shares equipment with three other municipalities in Prince George’s County – College Park, Greenbelt, and New Carrollton. The Town has 28 employees (21 full-time and 7 part-time) and a FY 2015 annual operating and capital budget of $3,181,000. The Town Council is composed of five elected members, each with two-year terms. The Council candidate that receives the highest number of votes in the election is mayor; the candidate with the second highest number of votes is the mayor pro tempore. As a body, the Town Council functions as the chief executive officer of the Town of Berwyn Heights. It hires the Town Administrator and all department directors and sets policies and priorities for the Town. Minimum requirements for the position include a bachelor’s degree, 3-5 years of local government experience, and strong budget, project management, citizen engagement, and communication skills. Preferred qualifications include a master’s degree, experience working in a multicultural environment, management skills, and demonstrated cooperation with other governmental entities. The ideal Town Administrator is confident, diplomatic, flexible, analytical, and organized. The Town Administrator will have strong financial management skills and an ability to prioritize, and will be technically savvy. The Town Administrator will develop employees and foster a work environment in which they are empowered, but also are held accountable. The Town Administrator will be an excellent communicator with strong verbal and written communication skills and be able to work well with residents. The Town Administrator will forge strong relationships with community partners, including county government, neighboring municipalities, the public school system, and other town groups and organizations to accomplish mutual goals. The ideal Administrator will be skilled in intergovernmental relations, working with other municipalities, county, and state government officials to continuously improve service delivery to residents. Berwyn Heights is a safe place to raise children and take an evening stroll after dinner. The Town is located north of Washington D.C., just inside the I-495 Capital Beltway and only 12 miles from the United States Capitol. Berwyn Heights is a youthful community, with a median age of 34.9 and almost 90 percent of its residents are 64 years of age or younger. The median household income is $96,771. Shaded by mature trees, the 1,027 single-family homes comprise a variety of architectural styles, from ornate Victorian and practical American foursquares to the post-war split-levels and ramblers of the 1950s and 60s. The Town is within walking distance of the University of Maryland and is a short drive to numerous federal agencies including the Beltsville Agricultural Research Center, the National Archives and Research Center, NOAA, the FDA, and the NASA Goddard Space Flight Center. The 3,123 residents of the Town of Berwyn Heights enjoy easy access to the cultural amenities of the greater Washington D.C. area. Nearby Metro stations provide convenient rail access to downtown Washington as well as Baltimore. The Town is also a short drive from Annapolis and Silver Spring. A diverse array of malls, libraries, restaurants, shops and other services are accessible within a 10 minute radius. Recreation opportunities abound, with easy access to the Greenbelt National Park, the Patuxent National Wildlife Research Refuge, and the 38-acre Lake Artemesia Natural Area and the Indian Creek Park, which are a few steps from the Town Administration Building. The salary range is $75,000 to $90,000 DOQ/DOE, with an excellent benefit package. Applications will be accepted electronically by The Novak Consulting Group. Apply online by at thenovakconsultinggroup.com/jobs and include cover letter, resume with salary history, and 3-5 professional references. The position is open until filled. The first review of resumes will begin July 31. Just click the button to get started.